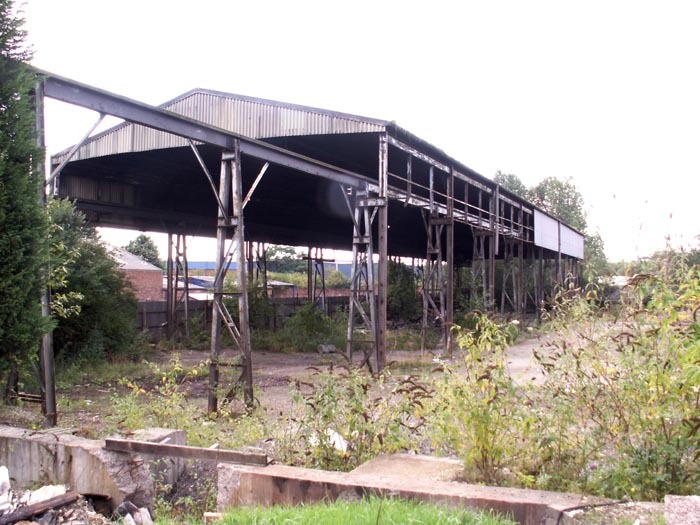 Following my prior visit to Wednesfield, I wasn't holding-out much hope for anything of interest at the site of the ex-Midland Railway's Heath Town station on their Wolverhampton High Level to Walsall Line: my pessimism being further compounded by the fact that Heath Town closed some 21 years prior to Wednesfield! 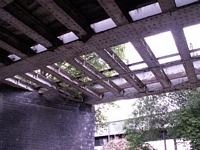 However, I was pleasantly surprised to see the above bridge still partly in situ as I approached the site along Grove Street: the station site itself being to the left of this shot. 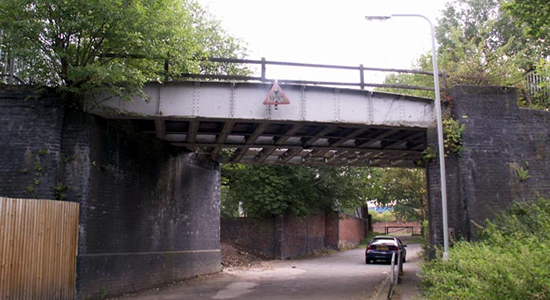 Above-left we are looking up at the bridge over Grove Street with the line passing from Walsall to the left, to Wolverhampton to the right. 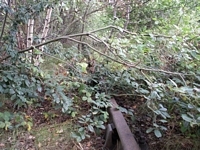 As can clearly be seen, the Wolverhampton line has been completeley removed from the bridge. Above-right we have passed under the bridge and turned immediately to the left to see the now defunct entrance to a site adjoining the line. 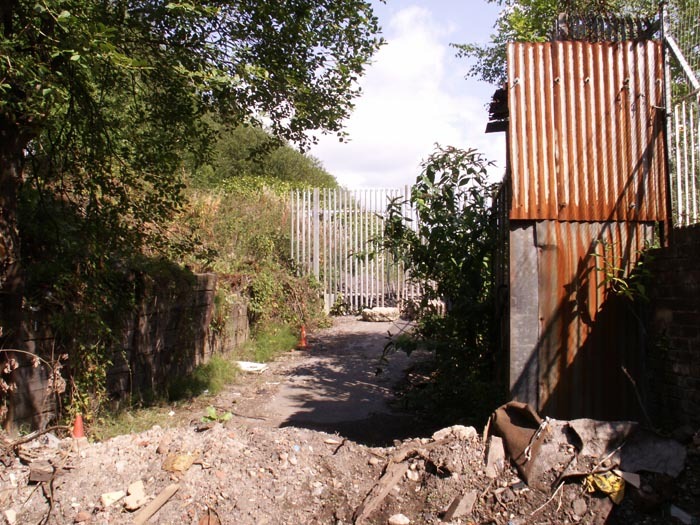 I cannot say with any degree of certainty, but would posit that this station had goods facilities during its lifetime and that this could have been the entrance to the goods yard: if you can either confirm or dispell this idea, I'd be interested to hear from you. 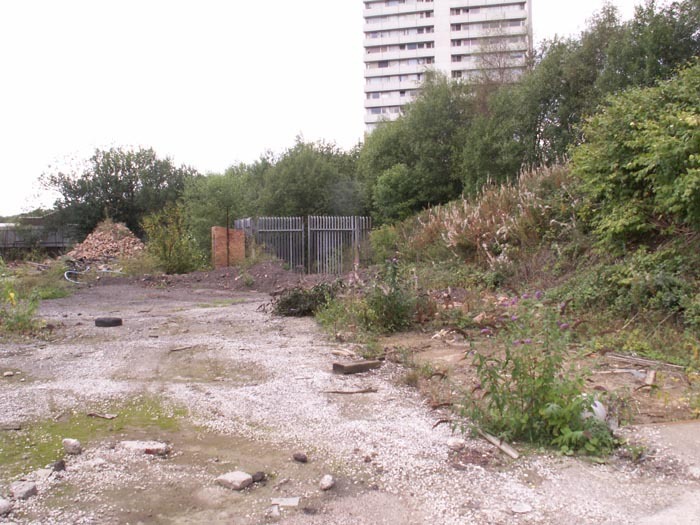 After much scrabbling over piles of rubble, I entered the aforementioned site and the view above-left is taken looking back to the entrance with the railway immediately to our right on a slight embankment. 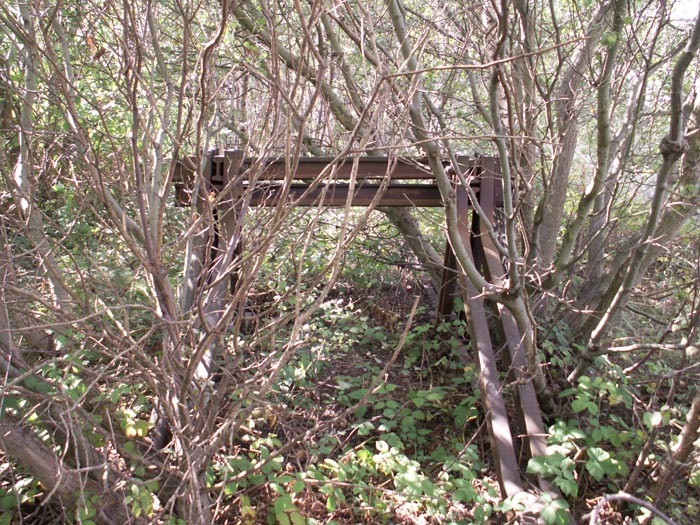 Above-right is the disused structure now standing at the site; use unknown but an interesting structure all the same. 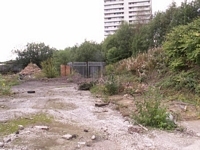 As is often the case at such a site, the negotiation of considerable amounts of brambles and assorted vegetation was necessary before coming upon any indication of the site's former life. 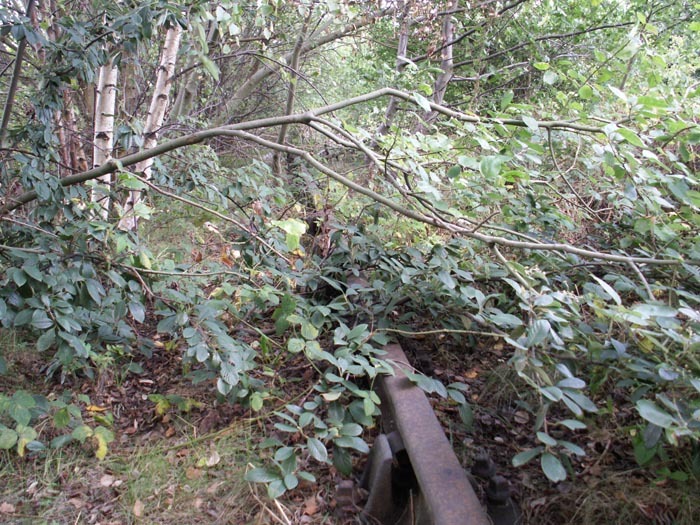 Here we have moved to the left of the previous shot and onto the embankment - looking in the direction of Wolverhampton - and can see a buffer stop hidden in the undergrowth. 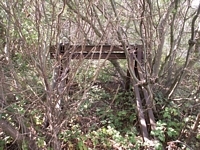 The station site itself, so far as I can make out, stood roughly at this spot stretching behind the photographer and ahead to the bridge seen earlier on this page. Undeterred by nature, above-right we see the track still in place as we walk towards the Grove Street overbridge. 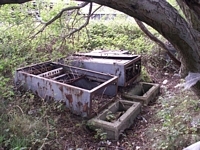 The most fascinating of finds can bee seen above: in a small clearing we see signalling cabinets and a short-post signal arm lying abandoned nect to the track. 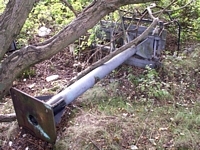 I had been rummaging around for a relic to take as a souvenier but, despite the potential for the signal post to look good in my back garden, I felt it best to leave it be for anyone else to view! 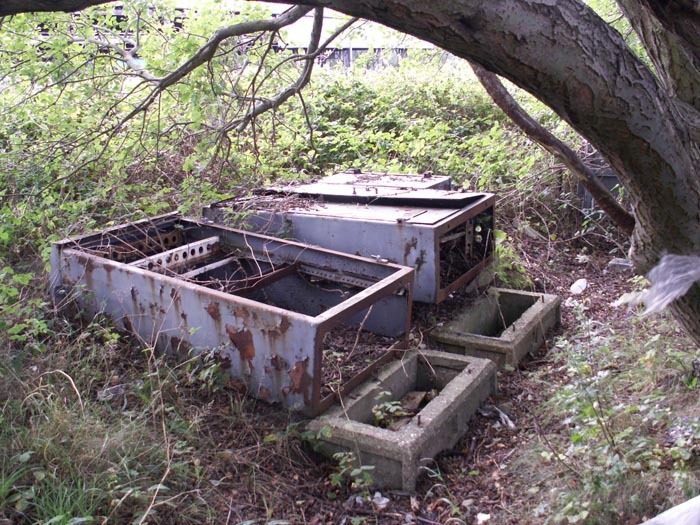 This was quite an interesting, albeit rather inaccessible, site to visit and the equipment seen above certainly added to its charm.